In addition to student performances throughout the year, we offer a variety of special events. For a full roster of happenings, visit our school calendar page. Here, we primarily feature faculty and guest special events which draw a regional, community-wide audience. *Here is an interesting read from ClassicalMusic.com about Holst’s the Planets (arr. Sykes) performed and recorded at St. Paul’s Cathedral. 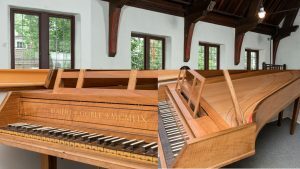 Experience the Harpsichord: A Masterclass and Demonstration with Ian Watson. 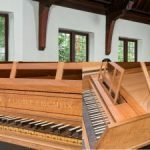 Ian Watson, Associate Conductor with the internationally respected Handel & Haydn Society and featured harpsichordist for the 1984 ‘Amadeus’ movie soundtrack, will lead us in learning about the instrument’s history and different types of harpsichords. He’ll coach one or two pre-selected students at the harpsichord, and conclude our time together with a spirited demonstration of the instrument. 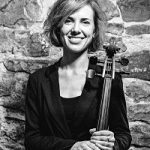 Attendees are invited to stay for the 5 pm concert, sponsored by Music at All Saints, featuring Mr. Watson, Harpsichord, and Guy Fishman, principal cellist with the Handel and Haydn Society. Tour our new home at 10 Irving Street (2nd and 3rd Floors) at All Saints Church. Learn about the architecture of this historic building. Enjoy student and faculty music. Morning and Afternoon activities planned. 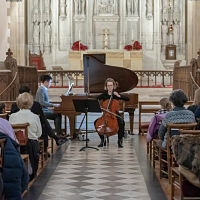 Faculty concert wraps up the day with an unusual array of music and instruments (see more below). Click Pakachoag Open House Schedule to view an overview of the day’s activities. Look below for more information about the faculty concert. 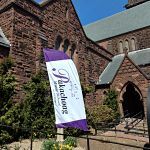 Parking Information: Guests may park in the church lot access via Pleasant Street and enter at the rear entrance off the lot; or park on Irving Street in the Worcester Public Schools Admin. Building (we have permission); metered parking available on Irving Street. Or, you might wish to use the Pleasant Street Parking Garage two blocks east on Pleasant Street. Stay tuned. We’ve been so busy planing the open house, we’ve not yet finalized plans for additional special events. Join us for this unusual faculty and alumni concert, highlighting the new studios and performance halls at All Saints. The School’ space is positioned on the 2nd and 3rd floors of All Saints Church. While future special events will often be programmed on the first floor (with disabled access possible by special arrangement), this particular program is a walk-around concert on both 2nd and 3rd floors which are accessed by stairs. 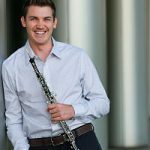 Colton, who joined the Pakachoag faculty in 2017, will be playing Schumann, Persichetti and other selections. Prospective oboists are welcomed and encouraged to meet Mr. Cox after the concert. With faculty member and sitarist Usha Verma and special guest Dr. Nishikant Sonwalkar, Tabla. This most unusual 20 string instrument has roots stretching back centuries. 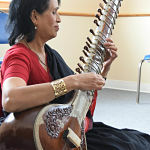 Usha’s connection to the sitar is much more recent when at the age of 15 she learned to play in her native India. Usha went on to major in music at Punjab University in Chandigarh, India, and later taught music at the college level. 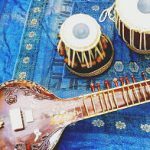 Usha continues today to share her life-long passion for the Sitar as both performer and teacher. Visit Worcester Schubertiad for complete information. 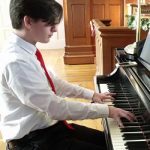 Andrew Lefferts, piano student of Inna Muravnik, will play Haydn and Chopin as part of this concert which features winners of Worcester Schubertiad’s Classical Idol Competition for 2017-2018. 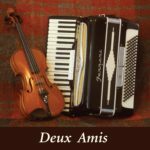 Sam, a native of Louisiana, and partner Betsy will perform traditional South Louisiana Cajun music. They’ll share some interesting tidbits about the music’s origin, its history, and how Cajun music has been influenced by its cultural surroundings. As an added treat, audience members can learn how to do Cajun two-steps and waltzes. Please call ahead for details related to building accessibility. Come be inspired! This recital features some of Pakachoag’s advancing students. Open by audition, the selection of students and instruments varies from year to year. 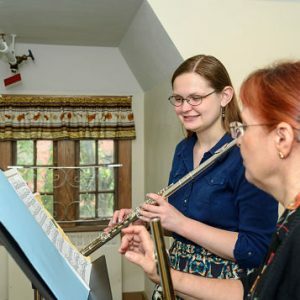 A selection of Pakachoag students will play for Christmas by Candlelight at Old Sturbridge Village. Saturday, December 16 at 6:00 to 6:45 in the Center Meetinghouse. Entry is with OSV ticket purchase.